Mocorunning doesn't stop following you when you graduate high school. We are always watching out for alumni succeeding in college as well. There is no doubt that William Rhea has achieved an incredible level of success. William was a former football and track star from Good Counsel High School who won WCAC titles and set school records. When he entered college at La Salle, he joined a fraternity, excelled in athletics, and maintained a very high grade point average. His good looks and chizzled body landed him a job modeling and acting in soap operas. William recently won the Atlantic-10 Conference titles in the 500m dash and 4x400m relay, but he takes the time to discuss his journey with the Montgomery County high school audience. MoCoRunning: What were your major athletic accomplishments year-by-year since high school? Rhea: My senior year of high school was my only season running track, but I won the WCAC in the long jump and high jump, while I took third in the triple jump. I was all-conference honorable mention on our football team, and second-team all conference as a wrestler. I also have the school record at Good Counsel in the high jump at 6'6. I was the school's most outstanding athlete and Track MVP. I was also All-Gazette in the high jump and All-County. In college for football, I was captain of our team as a junior. I hold the record for longest interception return for a touchdown at 98 yards, and I was an ESPN/Cosida Academic All-American as a sophomore. I no longer play football as I broke my ankle in my first game junior year. This is probably one of the reasons I have started to succeed in track. When I played football I was between 10 to 15 pounds heavier than I am now. Junior year I broke my ankle and only competed indoor 2 times I believe, but outdoor I was second team All-Conference in the high jump at 6-6 after only jumping 2 times before. Senior year I was A-10 performer of the week 2 times. I own the indoor school record for the open 400 the second time I ever ran one at 48.03. I have the record for the 500 at 103.03. I also anchor our 4x4 team, which has the indoor record at 3:16.38. 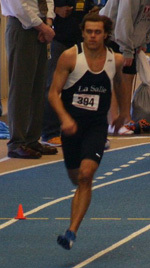 I also qualified for the IC4A championships in the 500, 400 and 4x4 which I will be running in next weekend. This past weekend I won the 500, 4x4, and took third in the high jump after only jumping twice before. Before last weekend, La Salle had never won either of those events. In the past we have been a distance-based team. MoCoRunning: Are you going to graduate this spring? Have you used all of your eligibility? Rhea: I will graduate with probably a 3.6 GPA. I may have indoor eligibility left next semester. I am applying for it but I don't know if the NCAA will give it to me. If I get it I will be staying and running. MoCoRunning: Do you know what you want to do after graduation? Rhea: After graduation I will be living in NYC modeling as I have been doing for the past 4 years, and I plan on getting my MBA from Fordham, NYU, or Columbia at some point. MoCoRunning: Big congrats on winning two A-10 conference titles! What was this meet like for you? Was it just like any other meet or was it something you have been wanting for a while? Rhea: This meet was very emotional as all conference championships are. This one was important because for me this is the beginning of the end. It was a different feeling that you can't explain. If I don't get my eligibility back then this will have been my last indoor A-10 championship, but more importantly the team was more-so relying on me to win the 500, and anchor our 4x4. I had never known how seniors felt before but that fire really helped me give all I had, and it wasn't just for me but for everyone else who had given everything they had for the last four or five years. We knew this was going to be a close battle between powerhouses Charlotte, Rhode Island, and ourselves,so it felt good to perform. I have definitely been waiting for A-10's because I have never won the A-10 before in any event; I have taken third, second and fourth a bunch of times so these victories in the 500 and 4x4 were important to me. I never thought that I would come here as a high jumper and never take a gold in that event. It was a great feeling to take 2 gold and a bronze medal though, and I can't wait to take that intensity to the IC4A championships and into the outdoor season. Getting away from just this meet, this season as a whole was really important to me because the LaSalle track team really for the first time became my family. I wasn't just a football player who came out to high jump; I was part of the track team. I was proud of the letters on my chest, and I took every race personally. We practiced out in the cold at 6 or 7am in the morning�sometimes twice a day and I felt we deserved to win and that I should never lose. I looked at the people who had run at LaSalle before me, the record holders and Olympians, and I was proud to wear a La Salle jersey. I felt that our sprint team, which had been our weak link before, was now earning its keep. This season was a bonding experience where we became really close, not just sprinter-to-sprinter, but we really became a whole team. It had not really been like that in the past years. I know that after I graduate I am not just leaving behind great athletes but great leaders who will easily fill my shoes. MoCoRunning: Why didn't you run the 400m at the A-10 Championship? Rhea: There are many reasons why I did not run the 400. My coach felt that it would benefit the team more if I ran the 500 because of who our other runners are. Andrew Maxwell and James Tchabo, are 48 second 400 runners so they were definitely going to place high. They ended up 2 and 3. Also, I am a stronger 500 runner, so the plan was for them to go most likely 1,3, or 2,3 in the 400 while in the 500 Jared Davis and myself to get 1,2, or 1,3. We ended up 1, 5 but that still netted us more points. Also, another factor was definitely defending 400m champ Ashhad Agyapong from Rhode Island. He is one of those athletes that does not lose and it would have been a very close 400, which could have gone either way. It was also his home track, so it would have been a gamble and we would have had to place one of the other 400 runners in the 500 and hope they scored high. I have a great head coach so I never question his tactics, but just for the record I did not dodge him, haha. MoCoRunning: How did you approach the high jump at this meet? How does your mark in the high jump compare to winning the 500? Rhea: My coach took the pressure off of me when he told me just try to snag a few points, do your best, and try to beat some guys from URI and Charlotte. I went out there with a different attitude though; I have placed second in the HJ twice before. I knew what I am capable of and I knew the team needed points. I didn't really think about what I was going to do. I moved my approach back, ran as fast as I could and jumped. I did not know a breakthrough was coming, but I knew I needed to score high. 6 5" is good for me but I have gone much higher and will definitely go much higher I just haven't practiced this year because I have been working on the sprints. This being my first season really running, I have focused my time more-so there. Winning the 500 to me was more important because when I came out I was the favorite and I won. I had never won an event at the A-10 meet before, and it was also the first time that anyone from La Salle had won the 500. I was more surprised than anything with the high jump because I hadn't practiced it. I just went out there and did it. My favorite race was the 4x4 and that is a race I will never forget. Just being the team's anchor and knowing they believe in me is a great feeling. Coming back from fourth place to win was a good feeling too but I would much rather have seen us win [as a team] than win myself so that's why the 4x4 is my favorite race. MoCoRunning: Long sprints and high jump is an interesting combination. How did you end up specializing in those events? Rhea: Default�I've always been able to jump high, so my senior year outdoors when I started to high jump I naturally just excelled quickly at it. My high school was not deep in the field and sprints so every meet I would do the long, triple, and high jump, along with one or two open events and a relay. I have no idea how I became a runner, but this year after not running an event for 3 years, we were in pre-season; I was in great shape and when our first time trail came around I performed very well. One of our sprint coaches had been trying to get me on our 4x4 for the past three years but somehow I was always an alternate who never ran, and I never complained because I had never really ran before, with the exception of a few meets outdoor in high school. Eventually our first meet came around and I placed second in the 500 with a time of 104.9 as well as running a 48 anchor leg of our 4x4, and I have been running ever since. MoCoRunning: Let's take a break from track talk to discuss university life. Why did you choose to attend La Salle? Rhea: There were a lot of reasons I chose La Salle over other schools, but mostly it was that I wanted to play Football and run track. This was a great fit because I got recruited for football and although I did not get recruited for track considering I only did one season of outdoor, my High School track coach knew the track coach here at La Salle. I ended up coming and meeting both coaches and I really liked the way they ran their programs. Academics are also one of the major reasons I came to La Salle and it has been great being an ISBT major, which is a new major not offered at many schools. MoCoRunning: What is ISBT and how do you make time for studying and running for a DI track team? Rhea: My major is Integrates Science Business and Technology. I have a dual concentration in biotechnology and information knowledge management. This is the study of innovation and technology development, which incorporates elements from the traditional disciplines of physics, chemistry, computer science, biology, engineering and business administration. It is time consuming, but one of the great perks of La Salle is small class sizes. The faculty has made my life as a student-athlete much easier than I expected because of the extra time they are willing to dedicate to their students. MoCoRunning: How, when and why did you get involved with a fraternity? Rhea: I am a proud member of the fraternity Phi Gamma Delta. I got involved with them as a freshman, and I do not exactly know why. I played football with a few guys who were in this fraternity and I was always around them. They were mentors of some sort to me on and off the field. Although they graduated 2 years before me, they have played an important role in who I am today. I do not know why I rushed�I guess before you pledge you really do not know what a fraternity is and it is hard to explain to people not in one but it has turned out to be one of the greatest decisions I made. People do not understand fraternities completely and there is a lot more to them then what you see in Animal House. It is more about a brotherhood and another family that you will always have that is not for college days alone. MoCoRunning: Does the frat interfere with athletics or academics at all? Rhea: No actually...since I have been a FIJI [nickname for Phi Gamma Delta], I have been on dean's list every semester, and I was also an Academic All-American. I have been both All-Academic for the MAAC and the Atlantic-10, and have a 3.6 GPA. My priorities are college, fraternity, and self, so school and track have always come first. We always have a great time together. We do a lot from community service projects to working Philadelphia Eagles games. We are also the 2-time undefeated defending champs of La Salle's Intramural football league. That was a really great experience because we won La Salle's tournament and we got the privilege to go play in the Philadelphia tournament against schools from the area. We enjoy just hanging out. It's not all about partying. It's about taking road trips to other schools and going to Atlantic City because we're bored and meeting up with guys who graduated 10 years ago. MoCoRunning: Now I have to ask you about this. You are involved with some sort of modeling agency. Explain how that came to be. What kind of ads do you do? Rhea: I am currently with CLICK models out of Manhattan. I have been with them for around four years. My uncle was actually a well-known model and photographer. He was co-host of TLC's show CoverShot and he got me started into the industry. I have done all sorts of ads, editorials, and campaigns. I have worked for clients from Abercrombie & Fitch, American Eagle, Kohl's to Cosmopolitan. I have also been on a soap opera briefly, and will pursue both acting and modeling after I graduate. MoCoRunning: Have you ever gone to any interesting places or met any famous people as a result of working as a model? Rhea: I have met many famous people and been to some beautiful countries. I have met Vin Diesel, Lenny Kravitz, David Schwimmer and more. I have never worked with any celebrities but I do see them out at parties, clubs, and around NYC, and Miami. I have worked in a few countries and all over the United States. My favorite country is Portugal, but Switzerland is beautiful as well. I do not love cold weather though, so I would rather spend my time on the beaches of Portugal or Spain. MoCoRunning: There's really no denying that you are a stud, but let's get back to track talk. Can you give us a good idea of what a typical week of workouts is like for you? Rhea: Well this changes weekly but pre-season we would come out and practice at 6:30 am running. This was mostly strength and endurance workouts, from running 40 minutes to doing repeat 400's. We also lifted three times a week: lightweight high reps.
In-season we lift two times a week sticking with the same basic principles of high-reps low-weights. For myself on Monday, I will get to practice and we will usually run hills. On Tuesdays I get to practice early and high jump. Afterwards I will then meet up with the rest of the team for a speed-endurance workout. Then a few hours later we meet back up to lift. Wednesdays we usually run around 20 minutes and do drills and striders to recover our legs. Thursdays we do technique work, I high jump, we do blocks, and prepare for the meet over the weekend. Friday is an easy day. We make sure to warm up and warm down, stretch, and take care of any loose ends. Then of course Saturday [at meets] we bring it, because that's what we train for. Sunday I jog for 20 and stretch on my own to prepare for the week ahead, at some point going over how I can improve. MoCoRunning: In Maryland, we got a lot of severe weather leading up to this weekend and I'm sure it was probably even worse up in Philadelphia. Did the winter weather hamper your ability to train leading up to the conference championship? How did you and your teammates deal with the ice and snow? Rhea: It hampered the field and the short sprinters more with our speed workouts and I could not practice the high jump. It did not affect our distance runners but it did give an advantage to other schools with indoor facilities or warmer weather. We have what we have so we modified our workouts and it was not a big deal. We just had to be more cautious when we worked out because of the conditions. MoCoRunning: What do you want to accomplish before you graduate? Rhea: I want La Salle to win the Atlantic 10 Conference Championship. That is my major goal. Winning as a team is a lot more important than any individual goals. I also want my 4x4 to qualify for NCAA's. On an individual side, I would like to run 46 which I believe is attainable for me, and I would like to also high jump 6-09. I feel like I've achieved a lot since I came to La Salle in 2003, and I think I've had a good run on the football field, on the track, and in the classroom.